We are all unique individuals, but we still share a lot in common. And one such commonality is that we are all spiritual beings in one way or another. Almost all of us are going through an unseen transformation at all stages of our lives. The term ‘spiritual blockage’ is used here as a part of my own perception of a period when I had to rethink the way I perceived spirituality. If you are also going through a same transitional period then hang in there, these times are tough but will pass shortly. As I have mentioned in the beginning also, we are all different in this world, and even our idea of spirituality is also different. The world is a spiritual portal where you have to walk your own path. You have to explore your spirituality by adopting different methods, ideologies. And it is fine to not to do what others are doing; forge your own way ahead. I believe in values, ethics, good and evil and God, but I don’t believe that for achieving the higher consciousness self-destruction is required. How can you achieve love when your path is corrupted? You are your own medium to attain your higher goal. According to the rules of Quantum Physics, reality changes when it is observed or measured. Thus you need not worry about your perspective of reality, because it does not define you. You need to let go of your spirituality in order to be really happy. You should always remember that spirituality helps to ease off turmoil and struggles but it does not eliminate them from your life. Spirituality brings kindness and confidence in your life. This helps you to balance your emotions. But this does not mean that now it is your responsibility to please everyone. 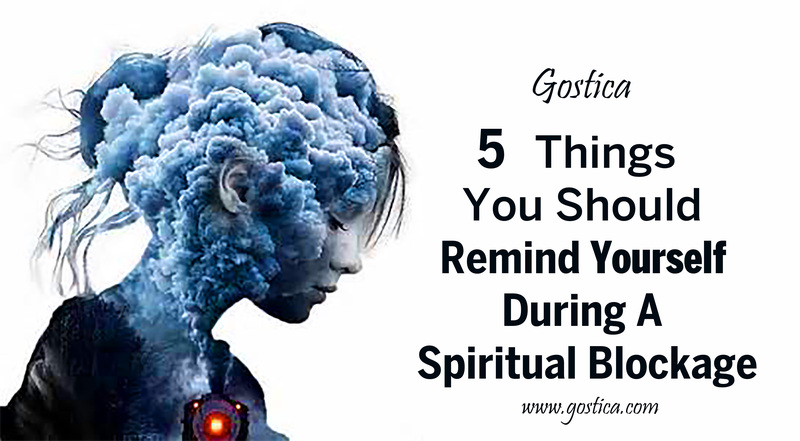 So these are the 5 things that you should remember during a spiritual blockage. Hope this will helps you to move ahead with your development.